Pete Hanshaw: Texture Monkey... version"some big number"
Texture Monkey... version"some big number"
It's written at a point where I actually feel I can competently write functional and readable code. It's UI uses the QT framework. Which it MUCH nicer to work with than the previous WX. It's been built around the premise that it should easily be portable across projects without having to change any of the source code- provided afew assumptions about project structure are met. 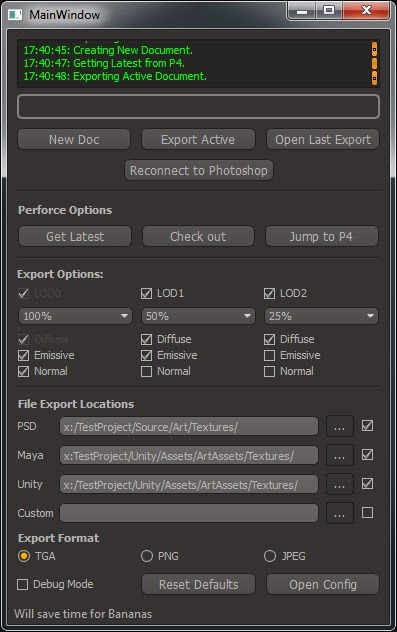 It does more than texture exporting, and now supports Perforce integration as well. Most importantly, it is written in a modular fashion, and can be expanded upon or cut back without too much trouble. It stores and loads tool settings as metadata in each PSD file, so you don't have to select those settings again when opening the file later. In addition to that, if you change the settings, then export the file, these new settings are saved to the PSD for later use. It supports exporting multiple LOD textures for different asset bundles. This is an experimental feature, and may be cut. But its fun to play around with. The idea behind this is that Unity doesn't make a distinction between different IOS devices, and instead lumps them all into one category in it's asset settings, even though there is a significant difference in specs between devices. It brings Perforce into the tool chain. When it checks out whatever active document is in Photoshop, it also brings along with it all the associated exported texture maps, basing it's search on the export locations stored in the Metadata and the source file name. I'm still thinking about adding a check in function... I kind of want to get people to check in via the P4 client, just so they have an overview of exactly what they are checking in before they actually commit it (especially if things like models are dependent on the texture changes, but fall out of the purview of this tool) For now, I have just added a function that brings the P4 client to the foreground. I have tried to add a little flexibility for other artists to be able to use this tool. It's mainly aimed at people working on textures for models, but by adding custom destinations and formats hopefully it will be of some use to export to custom locations in different formats. The configuration is all stored as an .ini file, and contains all the file naming rules, default destination folders and stuff like that. It can be hand edited, but I don't think I'm going to bother with a custom UI at this point.